Philip Hamburger has a new book out on the history of the administrative state. From an "originalist" perspective the administrative state is arguably unconstitutional, perhaps unquestionably so. But good luck in getting rid of it. I mean that only half facetiously; as a libertarian I really would like to see administrative agencies disappear. But I don't see it happening anytime soon. Hamburger is famous for arguing against the concept of "Separation of Church and State." One common mantra of the anti-Separation crowd is that those words are not found in the Constitution. The counter is but the concept is. Likewise with "Separation of Powers." Those words are not found in the Constitution; but the concept is. And administrative law violates the "Separation of Powers." The legislative, executive and judicial branches of government each has specific functions that the others may not perform. The problem with administrative law is that these "agencies" all perform quasi-legislative, executive and judicial acts as though they were some fourth branch of government (not mentioned in the US Constitution!). Anyway you can hear Hamburger talk on the matter below. When England was a Catholic country, swearing oaths on physical copies of the Bible held a prominent place in the culture. 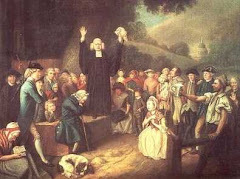 A religious movement whose adherents were known as Lollards opposed this practice in the early 15th century, as did Quakers in the 17th century. Lollards were willing to swear verbally by God, but were burned at the stake for being unwilling to swear on the Bible. 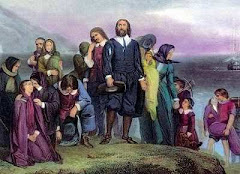 Quakers would not swear at all, which meant that they couldn't take oaths of allegiance and couldn't testify in court. Mohr writes, "A good technique for getting rid of a Quaker you didn't like was to accuse him of doing something illegal. Whether or not he was guilty, when he refused to take an oath his property would be confiscated and he would be thrown in jail for contempt of court." Read the full 1/11/1017 article here as it has been updated. ... I just published an article that readers of AC might find to be of interest. Here is the citation and the abstract. Mark David Hall, “Madison’s Memorial and Remonstrance, Jefferson’s Statute for Religious Liberty, and the Creation of the First Amendment,” American Political Thought. 3 (Spring 2014): 32-63. Folks, this is utter blasphemy. In regard to Adams’ thought, it exposes him as an enlightenment rationalist and humanist. He is not only hostile to the incarnation of Jesus Christ, he wants it eradicated from society. He believes there can be no true progress of knowledge in the world unless it is Christ-free. On April 30, 1789, the 225th anniversary of George Washington’s first inaugural ceremony, K. C. Davis posted a promotional blog for the September 2012 edition of his book, Don’t Know Much About George Washington’s Fashion Statement..
For the inauguration he was dressed in a brown suit, white silk stockings, and shoes with silver buckles, and he carried a sword. The suit cloth was made in a mill in Hartford, Connecticut, and Washington had said that he hoped it would soon be “unfashionable for agentleman to appear in any other dress” than one of American manufacture. Standing on the second- floor balcony, the “Father of Our Country” took the oath of office on a Masonic Bible. Legend has it that he kissed the Bible and said, “So help me God”— words not required by the Constitution. "Read my lips: no new taxes!" "If you like your healthcare plan, you can keep it." Ohio’s ban of lies and damn lies is inconsistent with the First Amendment. It is thus axiomatic—not merely truthy—that speech may only be restricted or regulated where doing so is necessary to further a compelling state interest. But the government has no compelling interest in eliminating truthiness from electioneering and, even if such an interest existed, such laws are unnecessary because any injury that candidates suffer from false statements is best redressed by pundits and satirists—and if necessary, civil defamation suits. Nor is the government well-suited for evaluating when a statement crosses the line into falsehood. More great American sagacity [with footnotes] here. I haven't had a chance to read the original decision. Though, Walter Olson's opinion on the matter at Secular Right seems quite "fair and balanced" for lack of a better term. Tara Ross: "This Week in History: Monroe’s birthday, Washington inaugurated, Rhode Island declares independence"
This is a writer to whom we ought pay more attention. From the lack of posts, you can tell I've been busy. American Creation participants might want to discuss the articles in this link from John Fea from last Sunday. Lots of great stuff to read there.